We grow our own cabbage here at the cottage, so we have special recipes that we make at certain times of the year. 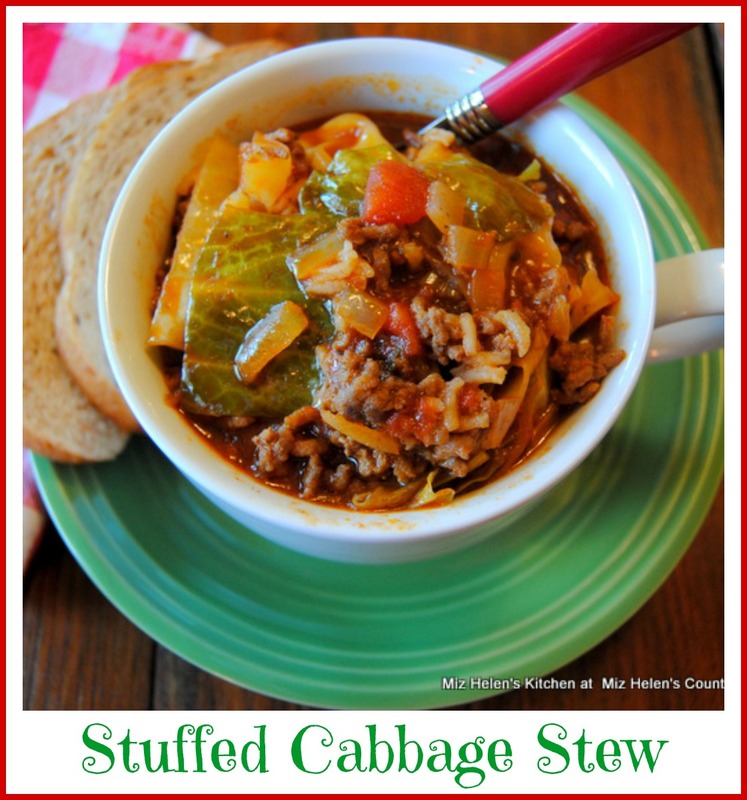 One of our favorite cabbage recipes for this time of the year is our Stuffed Cabbage Stew.There are many recipes for cabbage soups but this recipe is much thicker and it also has a very special flavor. Our family always looks forward to this special stew and we serve it with my Grandmothers Irish Soda Bread. In a heavy stock pot, brown the ground chuck and add the onion and garlic. Cook until the onion is clear and the meat is browned. Add the tomato paste and then add the diced tomatoes and the rice. Stir in the thyme, oregano, and cider vinegar. Add the juices and the beef broth, stirring well. Cover and cook on medium until the cabbage is tender. Reduce the heat to low and cook for 30 minutes. Remove the covered pot from the heat and let the cover stay on the pot and set aside for 20 minutes before serving. Thanks so much for stopping by to enjoy some of this Stuffed Cabbage Stew and Irish Soda Bread. Hope you have a great week and come back to see us real soon! Oh that looks so good!! I will print this recipe to add to my "to try" recipes! I sure hope you enjoy the stew when you get a chance to give it a try. Thanks so much for stopping by and have a great day! Ooh yes please! I would certainly love this stew, and I have a cabbage in my fridge right now. Thank you for sharing this recipe. I made the stew again just the other day and we can't seem to get enough of it, sure hope you enjoy it. Thanks so much for stopping by and have a wonderful week! Yum!! This looks like a wonderful dish on a cold night! Thanks for sharing on the What's for Dinner link up! Thanks so much for stopping by and you are so right, it is a wonderful dish for a cold night. Hope you have a great week! I love dishes with cabbage! This looks delicious. What a delightful recipe to celebrate St Patrick's Day - or any day - Miz Helen! Your Stuffed Cabbage Stew looks so delicious and comforting, and I love that it is made with your own home grown cabbage. This is the stuff Hearth and Soul is made of. Thank you so much for sharing with us!